A quiet and reflective journey into Jennifer Rees Larcombe's stirring faith, and the trials and tribulations her heart went through. 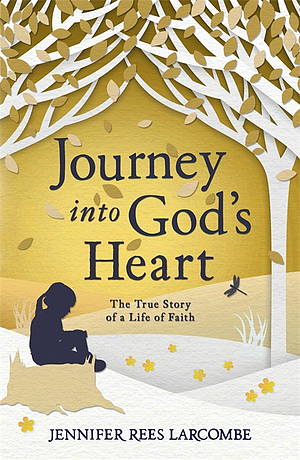 In Journey into God's Heart, Jennifer Rees Larcombe writes and epic autobiography that will grip all whose lives have been touched by her and surprise those who thought they knew they already knew her story.Even Jennifer herself has in the light of severe recent tragedies found herself gaining a new understanding of all she has been through. This book looks back at the traumas and insecurities of her childhood, the joys and trials of family life through the most testing of circumstances, the confusion caused by her life-threatening illness and subsequent miracle healing, the pain of bereavement and - the most recent chapter that no-one foresaw - divorce from her husband Tony. "Journey into God's Heart" is an epic saga of a unique woman's journey through the fire. This is an adventure that lasts a lifetime, a path strewn with heart-testing challenges. Written as compellingly as a novel, it presents a completely new perspective on the story told in Jennifer's previous autobiographical books "Beyond Healing" and "Unexpected Healing". Her journey unfolds against the backdrop of the momentous changes undergone by the evangelical and charismatic church in the mid and late twentieth century. Journey into God's Heart by Jennifer Rees Larcombe was published by Hodder & Stoughton in February 2006 and is our 13541st best seller. The ISBN for Journey into God's Heart is 9780340861578. This is a fantastic book from beginning to end. If you find it difficult to forgive then this is the book to read. The theme runs through the book and shows the power of God in a wonderful way. Only God working in Jennifer's life could have enabled her to forgive in the way she did. The last part of the book is moving beyond words and should be compulsory reading for all Christians. Non-Christians would also find it helpful, I'm sure. Got a question? No problem! Just click here to ask us about Journey into God's Heart.